USE Adjustable telescoping restraint without tie-rods. Ideal for systems that require periodic maintenance, the DJ405 can be adjusted to length to allow access for installation or removal of valves and other equipment. WORKING PRESSURE Up to the maximum rating of the flange. See submittal for details. 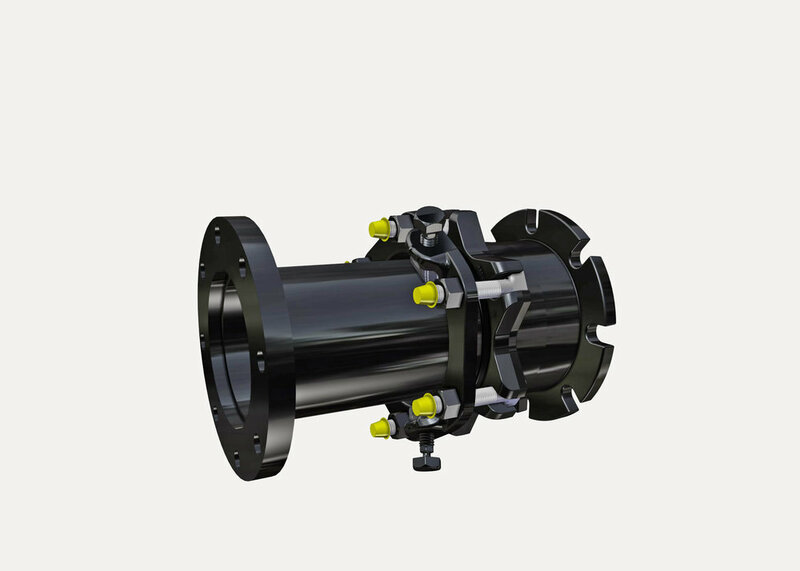 FLANGED SPOOL Customer-specified flange configurations are available. END RING & BODY See product submittals. GASKET MJ Gasket per AWWA C111 is made from virgin Styrene Butadiene Rubber (SBR) compounded for water and sewer service in accordance with ASTM D 2000 MBA 710. Flange gasket is O ring style and is made of Nitrile Butadiene Rubber (NBR) in accordance with ASTM D 2000.Other compounds available for petroleum, chemical, or high temperature service. BOLTS AND NUTS High strength low alloy steel bolts and nuts. Steel meets ASTM A588. Type 304 and 316 Stainless Steel bolt material optional. COATING Fusion bonded epoxy, NSF 61 certified. GLAND & RESTRAINT Romac’s RomaGrip, coated with Romabond Polyester coating. No tie rods necessary. Angular deflection allowed. See Romac RomaGrip submittal for further details.